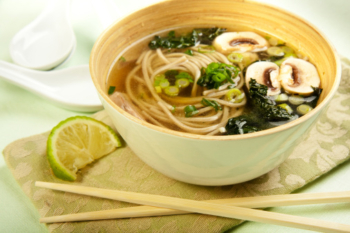 If you want a delicious noodle soup recipe that is gluten free, and perhaps even grain free try this soba soup. This soup is made with buckwheat noodles. Soba is Japanese for buckwheat. Wash kombu and wakame and place in a pot with the water. Add the ginger. Bring to a boil and boil gently for 10 – 20 minutes. Strain, saving Kombu and Wakame. Rinse off the seaweed and chop it into 1 inch cubes and return to the pot of water. Repeat this process 3 times –adding a total of 3 cups of water. Boil lightly for 5 more minutes, Remove from heat. Add miso to taste (do not cook the miso as it will kill the live enzymes). Let sit with lid on for 5 minutes. Serve the soba soup in bowls. Sprinkle “Fried Tofu” or sauteed mushrooms on top. If you want to be eating gluten free, make sure the soba is wheat free as many varieties out there add lots of wheat flour when the noodles are being made. 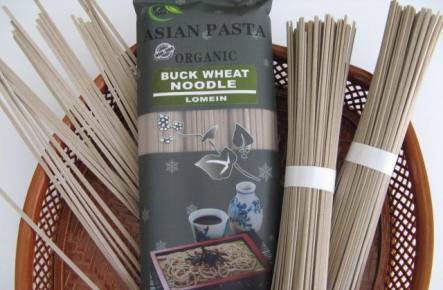 Here is a link to 100% buckwheat soba made in Japan Buckwheat Soba. Well, I’m an Asian and I’ve been eating Soba for ages. If you buy them in an Asian grocery, make sure to read the label. There are Sobas with purely refined flour and coloring. Just a tip.